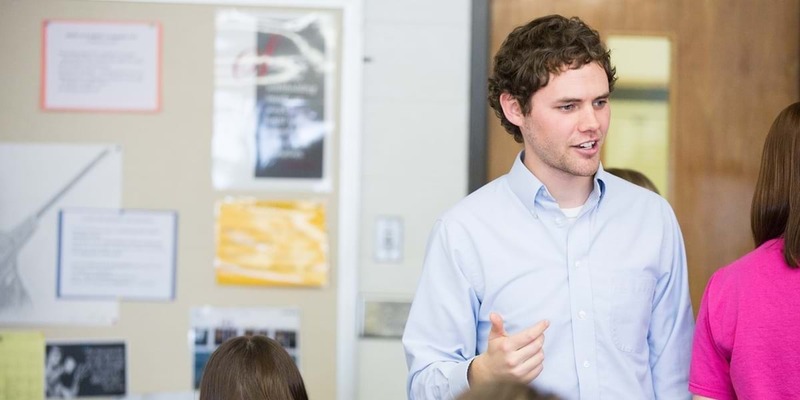 Chris says whenever he’s asked what he values most from his Northwestern experience, he answers, “residence life and my English professors.” Since graduating, the soccer player and Peer Learning Center tutor has taught both middle school and high school language arts and literature. He also coaches soccer and serves on his district's professional development leadership team. As an English education major, what do you appreciate about the two departments that prepared you for your chosen career? In my English classes, I learned not only how to read a text but also how to read the world—how to think critically not only about the page, but also about myself and my community. I grew from being a non-writer and a non-speaker to being confident in both. A strength of the education department is they get you into teaching experiences as soon as possible. In addition, I was encouraged to start working in the Peer Learning Center right away. Those teaching experiences—in actual classrooms and with student-writers—taught me as much about how to be a teacher as anything else in my four years. Describe your English professors and the influence they had on you. Before “student-centered” was a buzzword for me as a teacher, my English professors at Northwestern modeled for me what a student-centered classroom looks like. Class was never about what they knew as experts, but about what they could get out of us as students. My best teacher training was watching them as they led discussions and asked more from me than I thought I was capable of. Those experiences shape how I teach today. You said you value your NWC residence life experience. Describe the impact it had on you. My RD and RAs were intentional about creating a supportive learning community in the dorms. For many, college is a time for thinking big about your next steps in life and being exposed to new ways of thinking, so it’s important to have a group outside the classroom that helps you process everything. The guys in my dorm helped me see the importance of community, the value of investing in others’ lives, and the value in myself. An important part of teaching is creating a space where kids feel valued and supported in order to learn, and without my dorm experience at Northwestern, I don’t know if I would have the tools to do that effectively in my classroom. What do you enjoy about teaching high school English? Teaching has its share of challenges and frustrations, but most days it’s a rewarding profession. Regardless, one thing I rarely feel in my job is a lack of purpose. Every day there are 120-plus kids asking me to make valuable use of their time and make them feel safe and appreciated. My favorite class periods are those when I’m sitting in a circle with students, using a book to talk about what’s meaningful in life. One of my professors said he wanted to teach English because someone told him he could get paid to read good books and talk about them. My job is using the written word to help students make sense of themselves, their world and how to live life well. What a privilege!